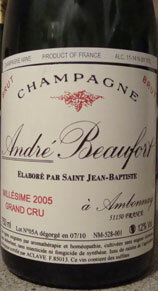 Jacques Beaufort, the winemaker at Andre Beaufort, is an organic and biodynamic producer. He even shuns sulphur and copper which the other strictest biodynamic and organic producers use. Supposedly Jacques became deathly ill in the late 1960s due to exposure to synthetic pesticides and herbicides used in the vineyards. By 1971 he had converted to entirely organic production and is passionate about removing all chemicals from winemaking. He makes his own compost from animal and plant sources, uses homeopathic formulas in his vineyards, only allows naturally occurring wild yeasts, and ages his wines as long as possible on their lees. His importer, North Berkeley Imports, refers to him as a "reclusive artist, eccentric farmer, organic pioneer." Apparently he is quite a guy and his wines speak for themselves. They are unique. For example his Rose, which I have yet to find, supposedly redefines Rose Champagnes for many. His wines do age, and in 2012 his 1985 was fascinating yet faded in 5-10 minutes (drink rapidly with a group of friends) and his 1995 was in a lovely place. They both exhibited strong red apple scents and flavors. He has about 18 acres of vineyards, 80 percent Pinot Noir and 20 percent Chardonnay. 4 Acres are 20-30 year old vines in the Grand Cru village of Ambonnay on southeast of Montagne de Reims, and about 14 acres, 80 percent Grand Cru, are in Poisy in the Cotes de Bar or Aube, which is much farther south and has terroir more similar to Chablis with its limestone than the rest of Champagne. Although Andre Beaufort Champagne is a Grower Producer, legally he is a negociant as he has created a family coop to prevent the vineyards from being partitioned between his 9 children due to complex French inheritance laws. There are a seemingly large number of Champagne's produced, some in very small quantities. These include including a vintage Ambonnay Brut, a vintage Polisy Brut, a demi sec (sweet), doux (very sweet), and several roses. Nose: lots of minerals, slate, chalk. Perfumed with some light fruits but the nose is much more about what's in the ground that what's growing out of it. Immediately impressive on the palate - very creamy with tangerine, guava, and fresh pineapple. Mango. Apple cider. Almost a long apple cider/apple juice finish as it warms and breathes. Wow, this is intense stuff. Quite vinous, almost a meal in itself. I had the first glass with a plate of fettuccine with clam sauce, and it went well, but this doesn't need food, it is food! Drank with Abalone with a Brown Cantonese Sauce on a bed of flat Italian parsley and Clams with Black Bean Sauce I whipped up, and I enjoyed it even more than the 2005 above! The nose was baked apple, spices, minerals and apple cider. On the palate there is immediate baked apple, it's creamy and minerally as well as laser focused and precise. Tropical fruits - tangerine, mango, guava. Long and lovely. They have an informative (all French) Website - Click here to visit. It is well done but not one of the easiest French Web sites for those with a very modest French proficiency.